Treasure Cove Resort Marina is a full-service, 120-slip marina, accommodating power boats up to 65-feet long, with seasonal and transient dockage. The marina sits on the Peconic River, in Riverhead, New York, the gateway to Long Island’s famed East End. We’re conveniently located in the middle of the twin forks of Long Island, with other popular North and South Fork destinations a short ride away. This resort destination features everything one would want in a vacation spot. With two restaurants on property, a bar with live music on Fridays, Saturdays and Sundays, indoor and outdoor swimming pools, a fitness center and many more amenities, a marina membership will give you that holiday feeling all summer long. Located adjacent to the Long Island Aquarium and directly behind the Hyatt Place Long Island/East End hotel, Treasure Cove Resort Marina, has a wide array of member perks sure to please all members of your family! With conveniences such as full-time mechanics on site, electrical hook ups and high-speed internet access, you’ll feel right at home as you enjoy your summer stays. Our location on the picturesque Peconic River in Riverhead, NY is perfect for families and individuals alike. 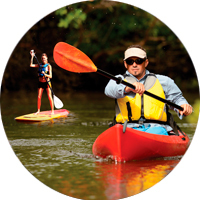 With the Long Island Aquarium right next door, Long Island Canoe Kayak Rentals within the marina, Tanger Outlets and Splish Splash nearby, there’s plenty of activities to keep everyone happy. Guests can also enjoy quick trips up the North Fork for Long Island’s Wine Country or the South Fork for Long Island’s famed Hamptons sites and beaches. 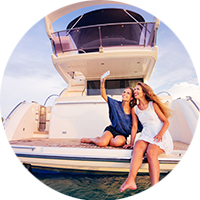 With all we have to offer, become a Treasure Cove Resort Marina member or transient visitor this summer! 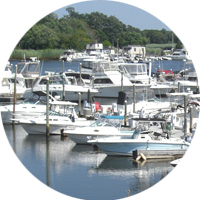 Treasure Cove Resort Marina, located on the Peconic River in Riverhead NY, is a full-service, 120-slip marina, accommodating power boats up to 65-feet long, with seasonal and transient dockage.